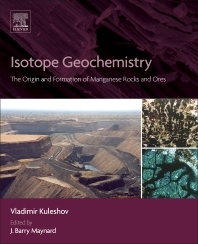 Isotope Geochemistry: The Origin and Formation of Manganese Rocks and Ores is a comprehensive reference on global manganese deposits, including their origins and formations. Manganese is both a significant industrial chemical, critical for steel-making, and a strategic mineral, occurring in abundance only in certain countries. Furthermore, it is used effectively in CO2 sequestration, helping to mitigate greenhouse gas emission challenges around the world. For these reasons, exploration for manganese is very active, yet access to the primary academic literature can be a challenge, especially in field operations. Isotope Geochemistry brings this material together in a single source, making it the ideal all-in-one reference that presents the supporting data, analytics, and interpretation from known manganese deposits. This book is an essential resource for researchers and scientists in multiple fields, including exploration and economic geologists, mineralogists, geochemists, and environmental scientists alike. Professor Maynard has had a distinguished research career that includes publication of 72 professional papers, authorship of 8 books and 8 field guides, and 56 presentations at professional meetings. He is known in particular as one of the world’s leading authorities on sedimentary ore deposits, particularly sedimentary Manganese (Mn) ore deposits, participating in key studies that documented their formation as a chemical precipitate under suboxic redox conditions in marine systems. He has also worked extensively on barium, copper, gold, lead, and uranium deposits. Professor Maynard’s second major area of research is on the sedimentology of siliciclastic rocks, both shales and sandstones. His research became increasing applied during the latter half of his career, involving several initiatives related to metals in the environment. He has been instrumental in training many Earth scientists through his career, a number of whom have themselves gone on to distinguished careers in academia and industry. At the University of Cincinnati, he served as head of the Geology Department for five years (1985-1990). In the broader professional community, he has served on committees for national, state, and local organizations. He served on multiple committees of the National Research Council of the National Academy of Sciences over a nearly 20-year period. He served on the Ohio Geological Survey Advisory Board and was a vice-chair of Ohio’s Low-level Radioactive Waste Repository Siting Authority for many years. Locally, he has been a member of the Greater Cincinnati Water Works Advisory Board from 1998 to the present. He has provided valuable service to professional societies as well. For the Society of Economic Geologists, he has been an associate editor of their flagship publication Economic Geology and the chair of their medals committee. For the Geological Society of America, he served as chairman and organizer of the 1992 Annual Meeting, which was held at the convention center in downtown Cincinnati. Professor Maynard has received several honors and accolades throughout his career. Vladimir Kuleshov is a doctor of geology and chief researcher at the Laboratory of isotope geochemistry and geochronology at the Geological Institute of Russian Academy of Sciences. In 1974 he graduated from the Department of Historical and Regional Geology, Geological Faculty of Moscow State University, with a focus in Geological survey and prospecting of mineral deposits. He is a well-known expert in the field of stable isotope geochemistry, particularly endogenous and sedimentary mineral deposits, isotope geochemistry of evaporite formations and isotope chemostratigraphy of Upper Paleozoic deposits of Russia. The main objects of his current research are sedimentary manganese and phosphorite deposits all over the world. A large section of his research is working in the field of isotope geochemistry of carbonates from evaporite formations of oil and gas basins of the Pripyat Trough (Belarus), Siberia (Irkutsk amphitheater) and the Cis-Ural. He has taught at the Department of Lithology and Marine Geology at Moscow State University since 2002. Doctor Sc V. Kuleshov has authored more than 90 scientific articles in the Russian language including “The isotopic composition and origin of deep carbonates.” Moscow, Science, 1986 and “Manganese rocks and ores: isotope geochemistry, origin, evolution of ore formation.” Mocow, Scientific World, 2013.